We all know that braces are known for being uncomfortable and do not have a good reputation for attractiveness! With the increase in technology and the increase in demand for subtle braces, the amount of options available to adults looking for a subtle way to straighten their teeth is growing continually. Invisible braces Moorgate offer individuals a way of straightening their teeth without feeling self-conscious. ‘Railroad tracks’ are a thing of the past as better solutions for straightening your teeth are developed. We are often told by our clients that they are the only one who knows they have got braces and are surprised when friends don’t notice for weeks. Investing in having your teeth straightened can not only increase your long term health and self confidence but it does not also have to affect your daily life in the present day. Thousands of adults are choosing to fit invisible braces Moorgate, for long term benefits. So what are invisible braces Moorgate made out of and what makes them different in design from standard adult braces? Well, there are number of different options you can use. First of all is a solution I imagine most of you are familiar with, the clear retainer. Us dentists call these clear retainers ‘Invisalign’ which is essentially a clear mould that fits around your teeth. This option is very popular with adults and professionals wanting to straighten their teeth without it affecting their lifestyle. You can slip them on and off to brush your teeth normally. The second option that is available for people wanting invisible braces is similar to the traditional brace. Technologies have evolved from the traditional metal fittings and are instead made from a ceramic, which blends with the teeth and is very unnoticeable. The third option is a product we call ‘lingual’ braces. 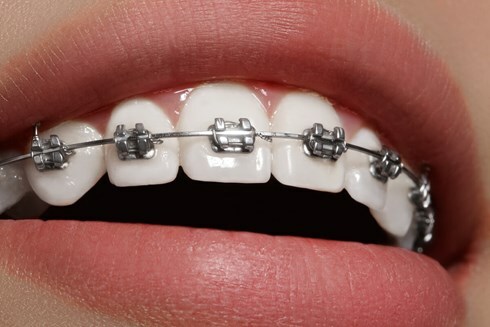 These braces are traditional in structure but are fitted behind the teeth. All of these solutions are very subtle and very effective at straightening your teeth.